Offering some of the very best that the resort of Saly, and indeed Senegal, has to offer, Lamantin Beach leads the way amongst its neighbouring hotels, providing a real ‘wow’ factor when it comes to excellent accommodation in beautiful surroundings. "We are delighted to reintroduce this stylish, beachfront hotel – the delicious food, relaxing spa and professional service will not disappoint.​"
The hydrotherapy spa, perfect for some pamper time whilst on holiday. The amazing beach location, with sand stretching from the restaurant terrace to the ocean. New Blue Bay rooms are due for completion in October, offering beachfront rooms with their own pool area. It's a short taxi ride to the resort of Saly, so you're likely to eat in the hotel regularly, where the food is fantastic. 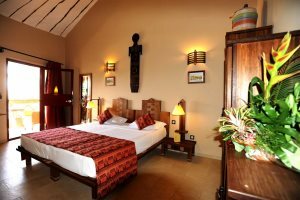 The hotel has an excellent reputation for elegant rooms, outstanding cuisine and first-class service. its beachfront position on a fabulous stretch of sand is hard to beat, ensuring plenty of space to relax under the African sun; alternatively there is plenty to do with a watersports centre and the Beach Club also offers a fitness centre and paddle tennis court. 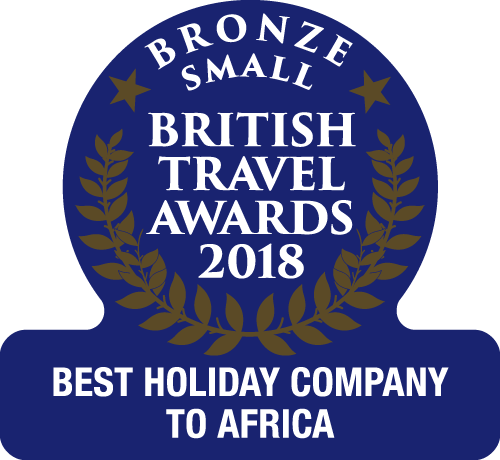 The accommodation itself is impressive, designed in an African style, with two-storey, manicured gardens, each with light and airy rooms complete with their own terrace or balcony. A new beachfront development is due to open for Winter 2018; the Blue Bay complex will have its own swimming pool and house 20 contemporary rooms, with either beach access or sea view. To totally unwind, you need go no further than the hotel’s spa; relax in the hydrotherapy pool and the therapeutic baths or with one of the many beauty and massage treatments on offer. The Saly Fishing Club also offers deep-sea fishing trips from the hotel’s own marina. You will be spoilt for choice when it comes to dining with sumptuous themed buffets served in the main restaurant, Les Palétuviers and à la carte dinners in the Beach Club, in its enviable position overlooking the beach. Lunches, drinks and evening entertainment are also available in the nautically styled Le Terrasse du Port, alongside the marina. Large room with small terrace, garden and/or pool view. Sleeps up to 3 people (2 adults & 1 child). These are standard rooms, located on the first floor with a small balcony, garden and/or pool view. Sleeps up to 3 people (2 adults & 1 child). These are larger rooms first floor rooms with a lounge area and private balcony. There is a separate entrance hall for the Deluxe rooms. Sleeps up to 4 people. 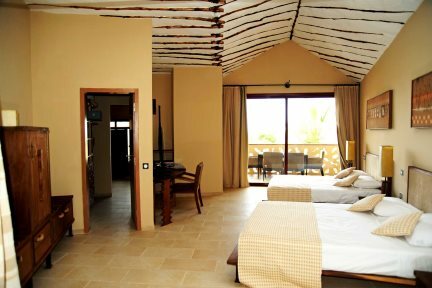 These are larger first floor rooms with a lounge area, private balcony and a pool/sea view. There is a separate entrance hall for the Deluxe rooms. Sleeps up to 4 people. Larger room with lounge area and private terrace. Has pool view and partial seaview. Sleeps up to 4 people. These large, luxurious rooms, new for winter 2018, have been designed by the architect Jean Marc Guilloux. They come with a lounge area, dressing room, private balcony/terrace and have a sea view. Sleeps up to 4 people. Larger room with lounge area and private terrace. Has full seaview. Sleeps up to 4 people. 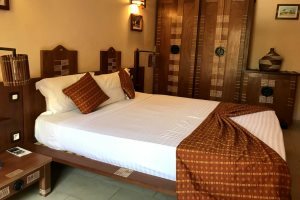 The resort of Saly is located on the “Petite Côte”, approximately 80 kilometres south of Dakar and 65 kilometres north of the Sine Saloum Delta. Saly is an ideal holiday destination that has long been popular with French and Belgian tourists and as such has a very established feel, with its variety of hotels, palm-fringed sandy beaches, calm clear waters, bars,restaurants, shops and a wide range of activities. 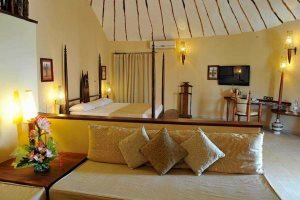 The smaller resort of La Somone is only a short drive from Saly and enjoys an idyllic location beside a stunning lagoon, home to the Réserve de la Somone, a birdwatcher’s paradise. Nearby you can also visit the Bandia Nature Reserve, a small but perfectly formed wildlife park where you can see roaming freely: giraffe,rhino, zebra, ostrich, antelope, buffalo, bush pigs, impala and many other birds and animals. For the more active, both Saly and La Somone have several excellent water sports centres offering a range of activities such as jet-skis, water-skiing, catamarans, kayaks and windsurfing, and several excellent fishing clubs offering world-class deep sea fishing. Quad and buggy tours or horse treks are available in and around the resorts and Saly is home to an attractive 18-hole golf course as well as the Accrobaobab Adventure Park, where you can climb, swing and slide on a series of nets and ropes amongst the baobab trees. In Saly there are a number of water sports centres located at regular intervals along the bay and several centres offering world-class ocean fishing. Most of the hotels also offer sporting facilities such as table tennis and volleyball. Saly also has an 18 hole, 72 par golf course, and children and adults alike will enjoy a trip to the Bandia Nature Reserve, where you can see wildlife such as zebra, giraffes and rhino up close, followed by a few hours in the Accrobaobab Adventure Park, where you can climb, swing and slide on a series of nets and ropes amongst the baobab trees. A varied excursion programme is also on offer from each hotel to ensure you see the best of the local area. In Saly, most of the hotels offer some form of evening entertainment. There are several nightclubs and discos where you will typically find lots of mirrors, fancy lighting, huge amps and, yes spinning disco balls! It's in the energetic dancing and music where you will really notice a difference to back home, consisting of African, R&B, Western pop and Techno. Saly also offers a selection of bars and restaurants within easy reach of the hotels.